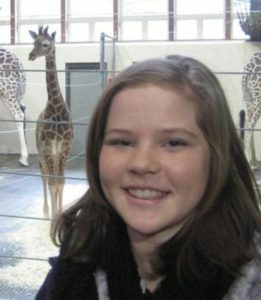 Lolo was a happy, active 10 year old when she was diagnosed with pediatric AML on 12/12/12. She was hospitalized at Children’s Hospital for most of the next 6 months and fought very hard against leukemia. On the night of Lolo’s 14th birthday party, the Hacker family learned that Lolo’s leukemia had returned after being in remission for almost three years. Once again, Lolo entered the hospital to fight for her life. In usual fashion, Lolo kept a positive attitude and a loving spirit. She left the hospital on July 25, 2016. Our hope is that her leukemia will remain in remission! Lolo is a freshman at Marian High School in Omaha. To read more about Lolo’s journey follow this link to Call To Water. When Lauren was first hospitalized in 2012, all she wanted was to go back to school with her classmates. On a snow day, when all the kids were eager to play in the snow, a few of her classmates learned that she was sad that she was stuck in a hospital room. A friend used social media to invite classmates to make snow angels for Lolo and within a short time, most of her classmates were on the lawn outside her window making snow angels. 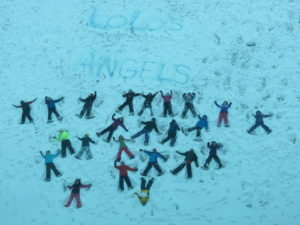 One of the moms used blue dye to spell out “Lolo’s Angels” and the idea of how to support a friend in need was born. Lolo’s fight is all about getting back to being a kid. Being a child with leukemia is hard enough, but the isolation can be devastating. Those snow angels brought hope to Lauren and rallied her spirits to fight her leukemia. Her strength and courage was fueled by the love she had for her classmates. For additional details about this story read the Omaha World Herald story by columnist Erin Grace.